The infamous Anonymous hacking group has crippled a string of Iranian state websites including those of the Office of the Supreme Leader, state police and the Islamic Revolutionary Guards in attacks launched yesterday. The coordinated Distributed Denial of Service attacks were launched at 5am GMT and targeted more than a dozen Iranian Government sites under the so-called Operation Iran. Anonymous had timed the attacks to coincide with International Workers' Day, commemorating the first nation-wide general strike in the US, which took place on May 1 in 1886. "OpIran attacks the governmental websites responsible for oppressing freedom of speech, information or ideas," the group wrote in a statement explaining the reasons for the attacks. The website of the Office of the Supreme Leader, Sayyid Ali Khamenei, was taken offline about an hour after attacks according to the groups' hit list but had been reinstated at the time of writing. 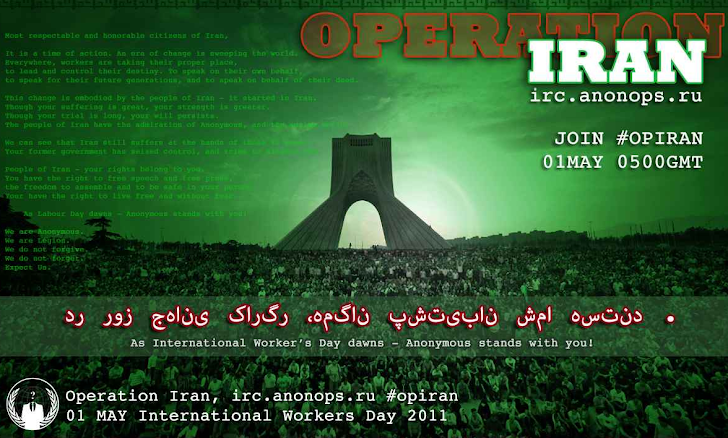 Anonymous shifted targets hourly and attacked websites including the Iranian Parliament and the Ministry of ICT. While some websites are back online, it is unknown if more destructive hacking had taken place. The group is famous for DDoS campaigns, but has also claimed responsibility for much more serious attacks involving data theft. The Iran DDoS attacks come as the nation's government claimed to have discovered a ﻿﻿Stuxnet﻿﻿-like worm reportedly targeting its nuclear facilities. Director of Iran’s Passive Defense Organisation said the Stars worm - named by Iranian officials - was part of an espionage attack similar to the Stuxnet virus which attacked and disabled about a tenth of the centrifuges that the government uses to enrich uranium. Attacks against Iranian state websites are continuing.